If you’ve spent any time in corporate America, or in the self-help aisle of the bookstore, you know about Stephen Covey’s The Seven Habits of Highly Effective People. I have spent a great deal of time in both, so I’m pretty familiar with the Seven Habits. I admire them, I respect them, and occasionally I even try to practice them. Alas, I’m still not terribly effective. Habit #2 is “Begin with the end in mind.” The idea is to have a clear picture of what you’re trying to achieve—a detailed, crystal-clear vision of the result you want. This applies not only to building mousetraps or what-have-you, but to your whole life—envision the life you want and the things that are important to you, and make your choices accordingly. Here’s my problem: I can’t picture the end. I don’t know exactly what I want. I’m almost 40, and my life vision is as clear as mud. I put a lot of mental energy into it. I do workshops, take tests, see therapists…. I make some decisions, get my vision all squared away, and then change my mind. While all this thinking is going on, nothing gets done. But a couple months ago, my aimless wandering paid off in an unexpected lesson. I took a painting class on right-brain painting at The Art Bar in Santa Ana. The instructor was Whitney Ferré. The class wasn’t about creating fine art or learning techniques. It was about quieting your left brain—the logical, linear, rule-based side—and allowing your right brain to do its intuitive, free-form, creative thing. For the sake of the lesson, we were going to paint owls. That’s all I knew. Also, I could bring wine…wine and painting is a good combination. Each person was given a big, blank canvas, a paper plate with some paint on it, and a fairly chunky paint brush. For the record, I’m a crafty girl. I like step-by-step tutorials, templates, and pre-coordinated collections of fashionable colors. I like to see a completed example of what I’m about to make, so I can mimic it. I’m good at that. So I wasn’t exactly comfortable with this “it doesn’t matter” approach. I didn’t even get to pick my colors. How was I supposed to know what I was going for, without an example? In this case, I really, really wanted to have the end in mind. But, I’m also a conflict-avoidant girl, so I just did as I was told and covered the canvas. My plate had red, yellow and white paint on it, so my canvas turned all kinds of gorgeous shades of pink and orange. It was lovely. Reluctantly, I took my chunky paint brush and, with black paint, slopped an outline of an owl over my pretty sunset background. It didn’t look like Whitney’s; it was kind of lopsided and way too big, but whatever. I was sipping my wine and happily covering my canvas, and the “it doesn’t matter” approach was growing on me. WAIT! Those are my favorite colors! I don’t want to paint over them! ARGH! What kind of stupid art lesson was this? Don’t worry about how it’s going to turn out? I heard my corporate-trained left-brain squawking all kinds of effectiveness at me; I could feel myself obsessing. Well, far be it for me to have EGO. I painted over the orange. I tried to pick other colors I like just as well, like aqua. Maybe some purple. Dang, it was turning out cool. After a quick lesson in color strategy, a couple more layers and a little more wine, my painting was complete: a big kooky owl with goofy eyes and ridiculously bright colors. He looks like he dropped some acid and flew through a rainbow and landed on my canvas. I love him. I love that silly owl every time I look at it, and here’s why: because I tried something new, I didn’t know how it was going to turn out, I shut off my ego and my need to be CORRECT, and out came something colorful and fun. It’s a product of my own fearless, intuitive right brain. The moral of the story is this: if you can’t begin with the end in mind, begin anyway. Just try. Sometimes the vision takes shape after you pick up your brush, or start typing, or say hello. Sometimes it evolves after some layering, some learning, or a glass of wine. The important thing is to be open to all kinds of beginnings. Don’t worry so much about being effective. Just begin. 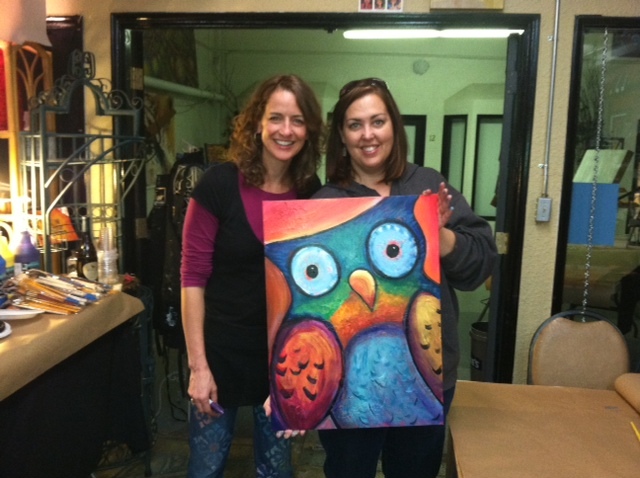 Here I am in The Art Bar with Whitney Ferre and my owl painting. This entry was posted in Inspiration, Motivation/ Self-help and tagged accepting yourself, art lessons, arts, ego, healthy-living, highly effective people, illustration, learning new things, letting go, life journey, mental-health, owl, painting, self-help, seven habits of highly effective people, starting over, The Art Bar, vision, Whitney Ferre by midlifemeg. Bookmark the permalink. I love the owl too! I love the message…just begin. I can’t always picture the end, but I’m usually glad that I started somewhere. I LOVE LOVE that goofy owl too!! Wish I could have been at that work shop with you!! Sounded like lots of fun!! P.S. You are so clever with your words and this awesome blog that I enjoy reading!! Wow Meg! I love you, your writting and your OWL! Thanks for sharing.